Call it a scoping problem — the conclusions you draw from looking through a microscope may be opposite to those you arrive at after examining the same evidence through a telescope. By drawing on both perspectives, scientists have come to a new, more-nuanced revelation: a pollinator crisis does indeed loom, but the crisis they see has little to do with a decline in bees and everything to do with economic globalization and the world's growing appetite for raspberries, cashews, chocolate, and other luxury crops. You don't have to don a protective suit and poke around beehives to see this crisis: it's there in your local supermarket when you find watermelons for sale in December. 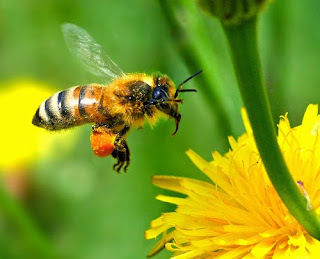 Image of honey bee courtesy of Flickr photographer autan under the Creative Commons License.